Before I proceed I must say the owner Mr. Pratap Darayani is a jolly good fellow and I just want him to wear a red shirt to be my Santa! He is very warm and welcoming. 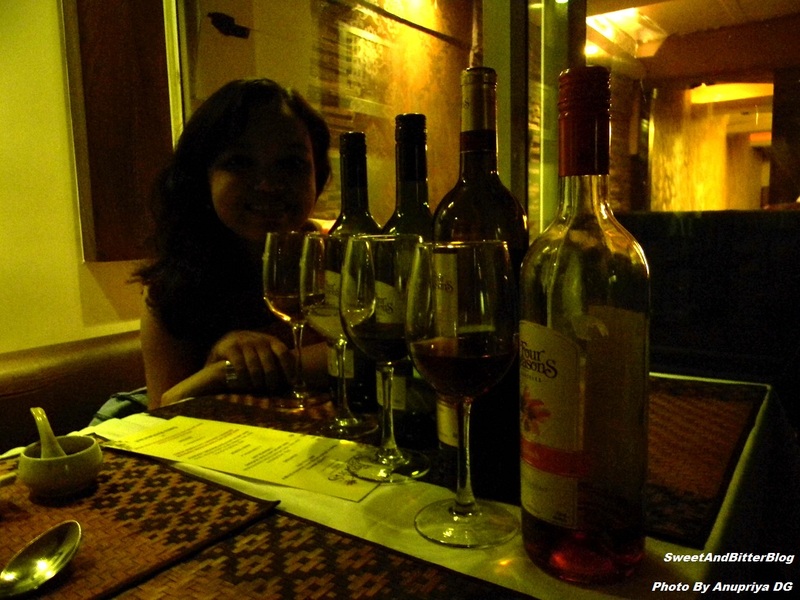 Entres – We had Veg Wantons and Herb Infused Chicken Reshmi Kebab with Four Seasons Chenin Blanc. Chenin Blanc is White Wine with a pale yellow color. It had a very fruity smell with loads of flavor of tropical fruits like pineapple and banana. Now, these fruits are not added to them but it’s the property of the grapes of that region to have a taste like that. The body (The sense of alcohol in the wine and the sense of feeling in the mouth) was very light and the wine was not very sharply acidic (Acidic wines generally has a mouth watering fell and cleans your palettes). So, because it does cleans your mouth it better to pair with very light food like salads. The veg wantons lightly fried and they paired perfectly with this light wine. The Kababs were little more aromatic for the wine. The Kababs were overpowering for the taste of the wine. This is just an example how it not necessary that all whites go great with whites meats. When you have your food with wine, you might be able to taste both of them together when you are sipping your wine in between your bites. Right after the starters we had Viognier – another white wine with a pale gold color but this had more berry and floral smell. After I smell, I had no intentions of having it but them the taste changed my thoughts. It more body and acidic compared to Chenin Blanc. It would have been perfect with the Kababs but by then I already gulped down the ones in my plates but asking for more was something I had no intentions of doing. Instead, I refilled my glass. LOL. Main Course – Before I finished by Viognier, the main course was served and so, I got ready for the next wine - Four Seasons Barrique Reserve Cabernet Sauvignon. The Reserves are the ones which were kept in French oak barrels so these have a very woody (Aromas often imparted by oak like vanilla and coffee) smell. This is their award winning red wine about which they are really proud. And the proud was justified by the taste. It was a full-bodied wine (Body : The sense of alcohol in the wine and the sense of feeling in the mouth) with a concentration of soft tannins (Tanning is a substance that causes a firm, mouth drying feeling. ).We had this rich deep cherry red wine with Grilled Fish (Another example that white meat goes great with red wine). This was the best paring of the evening. We also had Masala Au Gratin which was really yum but I felt it would have been better to taste it with Viognier. Dessert – Finally the dessert was served. It was Vanilla Ice Cream and Chocolate brownie with Chocolate Brownie. Along with it we were served Blush wine – my first Rosé. It was salmon pink and had a rosy smells with hint of strawberry. This was a refreshing wine. Personally it didn’t fit well with the desert as the chocolate was very overpowering. I left my desert and had only the wine. I loved Cabernet Sauvignon above all but then other were in love with Blush and why not? It was PINK! Can a girl ask for anything better? 1. The year on the bottle label is not the year bottling but the year the grapes were harvested. 2. There a conical depth in the bottom of the bottle (punt), deeper the depth – richer the wine. This is not a magical rule but correct most of the time. 3. Don’t go for a cute looking bottle because it might just be a away to hide the bad quality. I like the serious packing of the Four Seasons Wine. 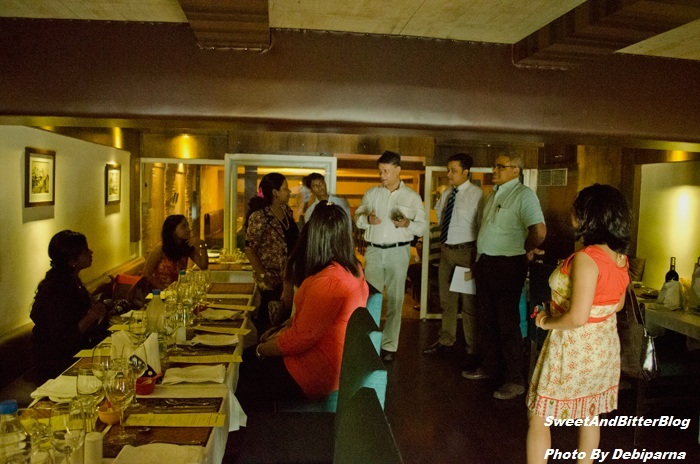 Vote of Thanks - Thanks to Shamita for taking out your time to tell us so much about wine. I frankly can pair them now even with dal chawal ! She is a sweet girl. God Bless her sweet heart. Comparing the color of Four Seasons Chenin Blanc and Viognier. Sitting pretty Shamita Singha. 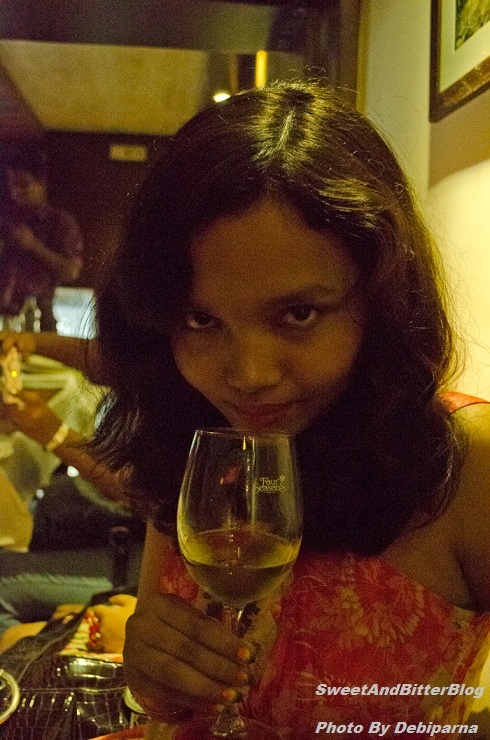 PS: I am not an expert in wine. Just sharing what I learnt in the event. TC.